Becoming a teacher-turned-inventor never crossed my mind earlier in my career. However, since joining forces with Peggy, this is the path I’ve traveled. KP Ten-Frame Tiles, an embodiment of the base-ten number system, came to life as we searched together to find a solution to the problems presented with pre-grouped manipulatives such as base-ten blocks. 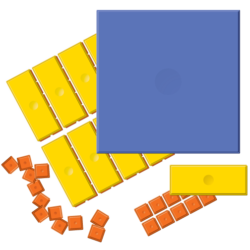 As physical and pictorial models, base-ten blocks do an adequate job of illustrating place-value-based quantities. However, everything falls apart when using base-ten blocks to demonstrate the action of grouping and ungrouping tens and magnitudes of ten. In her article, Choosing the Right Tool, Stacy Boote explains that base-ten blocks have a static form that renders them less useful when demonstrating operations such as division due to the need to group and ungroup. In contrast, when used to demonstrate the area model of multiplication, they will suffice because the action of grouping occurs after the model has done its job. “When using the area model, exchanges between place values do not occur in the creation of the rectangle or when finding the areas of the four inner rectangles. Renaming occurs at the end of the process, when calculating partial products. Therefore, using materials that can be easily manipulated is not an area model requirement” (Boote, p. 479). This regrouping issue that exists for long division also appears when representing the operations of addition and subtraction. The need to manipulate the materials for exchanges between place values is an important process. And when using base-ten blocks, the trades that must take place for grouping and ungrouping (aka, carrying and borrowing) obstruct student understanding rather than support it. Using groupable manipulatives, such as KP Ten-Frame Tiles, craft sticks, or unifix cubes, requires less cognitive load because the actions children demonstrate are relevant to the mathematics they are learning. When students are “regrouping,” they literally group and ungroup rather than “trade,” which is the only option with pre-grouped manipulatives such as base-ten blocks. So, you may ask, how do we resolve this issue? The answer is simple…use groupable manipulatives when the mathematics being modeled requires the action of grouping and ungrouping. KP Ten-Frame Tiles, craft sticks, or unifix cubes are a few options. It’s okay to use pictures of base-ten blocks to help kids visualize quantities, especially given this is the most common model used in testing situations. But when students need to manipulate to represent the movement between places, groupable models are the way to go. 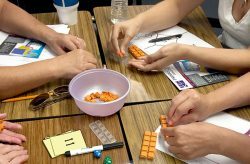 If you’d like to learn more, I recommend reading the groupable vs. pre-grouped manipulatives section in Teaching Student-Centered Mathematics, or the article linked above, Choosing the Right Tool. And take a look at Peggy’s series of journal entries, Beyond Base Ten Blocks. 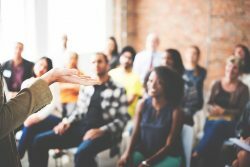 After reading this post, please join in on the conversation! 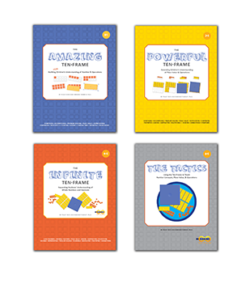 What have been your experiences with pre-grouped manipulatives such as base-ten blocks? What have been your successes and challenges? We always love to hear from you!